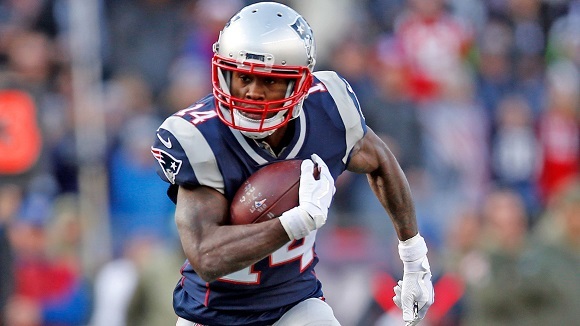 The Patriots received the 23rd pick in the 2018 NFL draft and a swapping of picks in the later rounds from the Los Angeles Rams for Brandin Cooks. Basically, the Patriots exchanged a first round pick from last year to move up 8 spots this year and got a year to experiment with Cooks. The Rams have traded away this draft for players that can make a splash right away while their window is open, and the Patriots are asset building. Could the Patriots want to trade their two first round picks to move up in the first round for a quarterback? Tom Brady is getting VERY long in the tooth. Or maybe the Patriots see a lot of holes in their roster going into the final years of the Tom Brady era and want to fill a couple of those voids in the first round this year. I can almost assure you that we won’t know until draft night. I didn’t own Brandin Cooks anywhere last season in fantasy football because I didn’t think that the draft day price was worth it. He ended up living up to his draft day price finishing 7th among wide receivers in standard scoring. But, his 65 receptions didn’t do his owners a lot of favors in PPR scoring. Cooks saw 114 targets in New England which was only three fewer than he saw in New Orleans in 2016. Unfortunately, his red zone target share left a lot to be desired as his 13.3% share ranked 63rd in the league. You can’t exactly blame Brady. Cooks’ 57% catch rate ranked 59th in the league while his catchable ball rate of 78.9% ranked 28th. Correct me if I’m wrong but throwing to Rob Gronkowski in the Red Zone is the way to go for the most part. In 2017, Cooks was supposed to team up with Julian Edelman but, unfortunately, we will never know how that was going to shake out. Where will Brandin Cooks line up in Los Angeles? Brendan Leister tweeted that it is tough to gauge where McVay will put him on the line of scrimmage. Cooks is a 5’10 speed demon but he only lined up in the slot 19.3% of the time in 2016 in New Orleans and 17.1% of snaps in New England. From a fantasy point of view, I think this will be another season where I end up fading Brandin Cooks in drafts. I believe that Cooper Kupp will continue to ascend and Robert Woods should continue to build on the successful relationship he built with Jared Goff. If you’re a person who believes in PFF grading, Cooks graded out slightly worse than Kupp and Woods in 2017. Just like last season, I wouldn’t count on a ton of receptions or double-digit touchdowns. The good news is that no matter what offense he plays in, Brandin is definitely capable of putting together a 1,000-yard season. If you play in PPR formats, I suggest letting somebody else reach. After all, this offense will still be built around the superior playmaking of Todd Gurley. This move provides a seismic shift to the wide receiver market. The Rams were perceived as major players in the Odell Beckham Jr. sweepstakes and the Brandin Cooks trade takes them out of the running. The Browns have a pocket full of draft picks that they could trade for Beckham, but they have the potential to already be set at the position if everything works in their favor. There are a couple of other teams that could probably afford to lock Beckham up long term in a sign and trade. The team that makes the most sense to me is the San Francisco 49ers but the Giants will likely have to get more realistic with their asking price. If the 49ers give up their 9th overall pick and a mid-round pick for Beckham, that gives the Giants two picks in the top 10 to go along with an extra 3rd round pick that they acquired from Tampa while trading away Jason Pierre Paul. The Brandin Cooks trade also takes away one willing suitor and makes it all the more likely that Beckham will return to the Giants in 2018. If that’s the case, either the Giants will have to fork out the dollars to get Beckham on the field, or he will have to have a change of heart and play on his current deal.